QA Technology offers a wide range of tip styles to support the various applications and test targets known in the industry. Experienced Test Engineers often have different preferences for the best tip styles to use on a given contact surface. When contacting clean pads or surfaces where witness marks must be minimized use tip styles such as the FLAT or SPHERICAL. For flat solder pads with clean and lightly contaminated surfaces where light witness marks are allowed use a CHISEL, SERRATED, CROWN or TRIAD, as they distribute the force over a greater area while minimizing the marking of the surface. Use a SPEAR, SHARP CHISEL, SHARP NEEDLE or RAZOR probes for difficult to test pads where heavily oxidized or flux-coated surfaces need to be displaced as the small tip area and aggressive angle of these probes will produce greater penetration into the surface. When testing flat pads with surface finishes such as HASL, OSP, immersion silver or tin tips such as the SPEAR, CHISEL(S) and RAZORS are recommended. QA does not recommend testing through conformal coatings or bare copper but if necessary, use tips such as the SHARP CHISELS and 9R RAZOR types. Use a CHISEL or STAR to contact open holes. A CHISEL has fewer contact edges than STAR and therefore higher contact pressure. 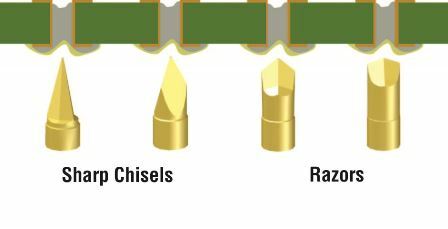 The CHISEL TRIAD is a good choice for contacting open holes where flux is present. The SPEAR is used when the rim of the hole must remain free of marks. Contact is made on a circle rather than on sharp edges. The BLADE and RAZOR will provide the highest penetrating pressure, since contact is made on just two sharp cutting edges. Although QA does not recommend testing on un-plated vias, the 6R RAZOR is the best choice. For filled (pasted) vias, heavy contaminates require the use of a SHARP CHISEL or RAZOR. The RAZOR tips are especially designed for this type of application. Choose the tip style which will be most stable on the lead in order to minimize sideloading the probe and to extend probe life. The SERRATED is generally the most stable on long leads. The CUP can be used on extremely long leads but are likely to require more maintenance. A standard CROWN (valleys cut straight across the point) is more stable than self-cleaning styles (valleys sloping down and out). Tip styles with fewer tips or sharper internal geometry such as a TRIAD are best used on short contaminated leads. Smaller leads will require tip styles with closely spaced cutting edges to trap the leads. The Slotted CUP is designed to help prevent contaminate build-up. SERRATED or FLAT tip styles are stable on this type of contact, but have limited ability to penetrate contamination. Use a FLAT in clean conditions and with higher spring forces. A self-cleaning CROWN will require less maintenance than a CUP if used in an upward-pointing orientation, but are more likely than a CUP to glance off a post. A slotted CUP is best when used upwards, since a traditional CUP can easily collect dust and contamination from the Unit Under Test, they are best used in a horizontal or downward-pointing orientation. A FLAT is the least aggressive and is used where minimal witness marks are desired. The MICRO-SERRATED tip styles are more durable and are recommended on points that have light flux residues. The FLAT STAR is self-cleaning and is used when a board will see high cycle counts. The CENTER POINT STAR is the most aggressive, making it ideal for no-clean flux processes where sharper cutting edges are needed.